Sliding door lock and pull for passageway (pocket) doors; reversible; adjust from 1-3/8" to 1-3/4" thick doors. Contents: 1 lock and pull; 1 set of installation screws. Fits doors from 1-1/4? to 1-5/8? thick. Includes flush pull on edge of door. Manufactured of solid brass for maximum corrosion resistance. Fits doors from 1-1/4? to 1-5/8? thick. Includes flush pull on edge of door. Manufactured of solid brass for maximum corrosion resistance. Fits doors from 1-1/4? to 1-5/8? thick. Includes flush pull on edge of door. Manufactured of solid brass for maximum corrosion resistance. 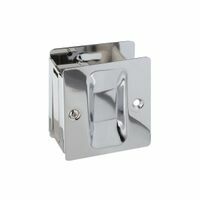 National Hardware Pocket Door Pull, Series: V1950, Suitable For Use With: 1-1/4 - 1-5/8 in Thick Doors, Solid Brass, Chrome Plated Sliding door combination pull for passageway (pocket) doors; reversible; adjust for 1-3/8" to 1-3/4" door; plates are polished solid brass. Latch engages and disengages by rotating round thumb turn. Solid brass faceplate. (2-1/2"L x 2-11/16"W). Adjustable for 1-3/8" or 1-3/4" doors, without the need for special screws. Coined edges eliminate bowing of faceplate. Curved zinc die cast finger pull. Inner working construction eliminates jamming of lock. National Hardware Pocket Door Latch, Series: V1951, Suitable For Use With: 1-3/8 in Thickness Doors, Solid Brass, Chrome Plated Fits doors 1-3/8" thick. Designed with latching mechanism to lock door. For safety purposes, door can be unlocked using screwdriver.